Vedic Math - Multiplication of numbers whose last digits add to 10 and first digits are same and vice-versa. We had discussed this method in our previous articles for 2-digit numbers and today we shall explain the same method for 3-digit numbers. Here we can see that right digits sum is 100 i.e. (92 + 8) and left side digits are same. Here we can now apply the same method, which we discussed earlier for 2-digit number. But this time we must expect to have four figures on the right-hand side. First, multiply the right side numbers(92 x 08) and the result is 0736. Second, multiply 3 by the number that follows it, i.e.4, so the result of (3 x 4) is 12. And now the final output is 120736. Here 95 + 05 = 100 and left side digits are same i.e. '7'. Hence it qualifies for this case. Here we can see that right digits sum is 10 i.e. (9 + 1) and left side digits are same i.e. 24. So we can now apply the same method as described above. Case 1: Where numbers are not qualified for above case in general, but can be qualified after converting their form. Example is given below. 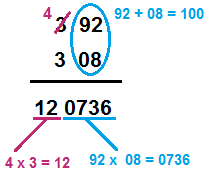 The point to notice in the above example is that '39' needs '31' to qualify for method, and then we found that 93 is '3 × 31'. In 35 x 37, both left hand numbers are 3, but 5 + 7 = 12 which is greater than 10. We can solve this in two ways. Second approach is, we modify the numbers in such a way that we can apply the method discussed above. So we split 35 as 33 + 2. And observe that (33 x 37) comes under the above discussed method. Now, take one more example where first digit remains same but addition of last digits is less than 10. Here we can see that left hand digits sum is 10 i.e. (4 + 6) and right hand digits are same i.e. 7 . So we can now apply the following method. Multiply the first digit of each number together i.e. (4 x 6 = 24). Add the last figure (7) into it (24 + 7 = 31) which is the first part of the answer. Multiplying the last figures together(i.e.7 × 7 = 49) which is the last part of the answer. The final answer is 3149. How do you like these Vedic Maths technique, please let us know.